Long before the medical world gave a name to OCD I began to wear my lucky turquoise boxer shorts and my purple socks. Not a great fashion statement-but goodness gracious, such a lucky combo! They are only good for selling, they are impotent on buying trips. But on days when the appointments diary throws up some likely high spending customers, there`s nothing like them for boosting the takings. On occasion, when someone`s turned up unexpectedly, I`ve been known to run down the side corridor and rush home if I`m not wearing the lucky combo! Fortunately I have several pairs of the turquoise boxers and I have been unwilling to try to distinguish whether one pair is luckier than another. But I have only ever had two pairs of purple socks. The first pair burst at the toes long since. I tried to wear them on top of a rather fetching pair of pink Paul Smith socks, but Mr Smith`s ones seemed to have a bad effect and takings slumped. A replacement pair of purple was purchased-but only one pair: I have my doubts about more than one pair, even though it works with the pants. A handful of superstitions have ruled my antiques trading career. I always enter an antiques fair and turn right. It doesn`t always, always, always work. I`ve tried varying it-but that never ever works. In the days when I went to Clignancourt flea market, every Friday, I had to be the first through the iron gates when they opened on the dot of 5am. Back then I could fly to Paris, flights were scrapped the moment Eurostar opened up the line to the French capital. I would always sit in seat 1F. By the time I was forced to travel by Eurostar seat allocation was very different and was carried out at random by computer. Buying at the flea market was never the same again. A ritual on arrival at the flea market dictated that I would have to stand at the bow end of the bar in the Cafe Paul Bert, only right at the apex of the bow end would do. If I`d been delayed, delving in the back of a dealer`s car in the Rue Jules Vallees and missed my optimum position then I`d wait to order my coffee and croissant until the space was vacated. Once a month I was joined by Laurence, a London dealer, he wouldn`t mind me saying, is a man who watches every penny of his expenses. But he is almost as superstitious as I am. About ten years ago he bought me a coffee at 5.30am(I don`t think he has a special place to stand), that week he had one of his best buying mornings. From then onwards he had to buy me a coffee each time. he wouldn`t buy my croissant, I had to pay for that as it was not part of the ritual! One day I insisted on paying for him. boy, was it a useless morning afterwards. Another place I have always been the first through the door is Bath Decorative Fair, held each year in early March. This entails huddling in a cold stone doorway for several hours until opening at noon. One year I was delayed by a crash on the motorway and arrived to find the lady from Spitalfields, who is often second in line had beaten me to it. Fortunately she is as superstitious as me and said I had to go first. She was afraid it wouldn`t be the same for her, if she went first. luckily she turned left, so we don`t get in each others way. Another habit dictates each day, each morning on the way to the shop in Arundel( it`s a long commute from our house around the corner!) I always walk down King`s Arms Hill where I am faced with five early 19th century iron balustrades at the top of the hill. Even Dealer my border terrier (amazingly he was named this before he came to live with us) knows that you only walk between balustrade two and balustrade three. 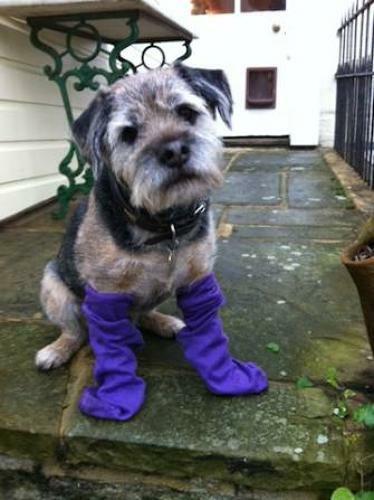 When he starts wearing purple socks, I`ll know we`re both barking!! 2pm....(Since photographing Dealer in purple socks this morning I have received a healthy cheque in the post and a good appointment for January. methinks this isn`t the last morning dealer will be invited to put the socks on! ).